Before I get into the meat of this post, I wanted to put a question out there to you, my lovely readers. What kind of posts do you like to see from me? I aim to please...and I want to make sure I'm not boring you all silly!So be dearies, and leave me a comment telling me what you like to see me post...decorating ideas? tutorials? etc?...please. Now on to the post. My real life friend Damaris asked me to do a post on canopy beds. I don't know about you all, but the term "canopy bed" brings to mind the ruffle-topped bed my older sister had in the 70's. 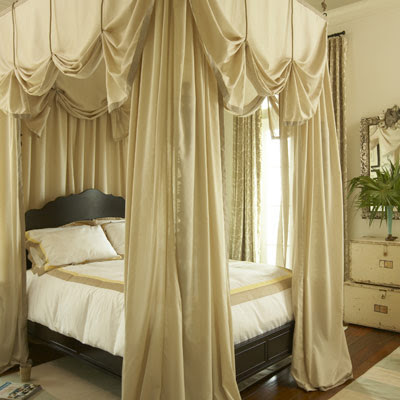 But canopy beds are not old and stuffy anymore... they are chic and fun, and can really make a room. Take a look at some of these great canopies I found around the web...and because we're all budget conscious now-a-days, I wanted to take a minute and discuss how we can achieve some of these looks for a minimal investment. I have professed my love of Serena & Lily before. Take a look at this darling canopy I found in their latest catalog! This look can be easily achieved by using bedsheets! (This will actually save beaucoup on the fabric investment). Simply buy sets of coordinating sheets...I'm guessing you could get away with 4 sets - 2 of each color. This canopy is made by suspending a ring from the ceiling (think lampshade ring and fishing wire). The cute details around the ring could easily be made from the coordinating fitted sheets as could the tie backs which appear to also be suspended from the ceiling with fishing wire. This fun canopy is from the 2004 HGTV dream home. 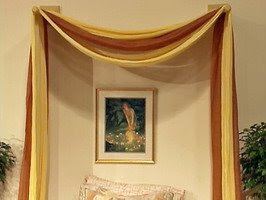 This canopy hangs from a corona (crown) attached to the wall above the bed and can easily be achieved in a similar method to the previous canopy. Coronas can be created with a variety of materials...and covered with coordinating fabric. Bedsheets would again offer an affordable alternative to yards of fabric. This garden trellis idea is quite charming! The trick would be to find a trellis the correct width. The look could be softened by adding fabric. This more traditional canopy makes quite a statement. It is suspended from the ceiling with wires and hooks, but could easily be attached to the ceiling by building a cornice frame and using suspension or other rods to hold the fabric (warning...this amount of fabric would be very heavy!) This type of canopy takes up a lot of visual space, but also makes the ceiling appear higher. It is a great way to ground an expansive room, but can also be used in a smaller room, providing the amount of other furniture pieces is limited. This simple canopy was created using stair balusters. It could be a great "shabby" project with the use of reclaimed architectural pieces. Finally, this great room from Candice Olson...you know I love her! This is a canopied daybed. The canopy is a fairly traditional shape, however, Candice...true to form...uses it in a non-traditional way. It sits against the wall with the fabric hanging down the back to create a sort of headboard effect. The fabric is kept light and fairly sheer so as not to add weight, while still adding softness. So go ahead and add a little romance. If you create a canopy or have a great one to share, let me know! I'd love to see it! I love your blog, the combination of posts is excellent! DIY tutorials, examples from your owh home and collations on a theme (like this post) provide good variety for me as a reader. I especially like it when you assess an image and break it down to its parts, thereby making it achievable! I say keep up the good work! I love everything that you are doing on your blog. We have a canopy bed as well but our bedroom is a huge work in the process. I have not painted or put up any decorations. I posted about our bed a few posts back on my blog. I had a window that was right behind our canopy bed and I showed how I hid the window. Love the traditional bed. LOVE IT! I might hide in there on Saturday mornings! I could stash chocolate in the ruffles... so romantic. Thank you for all the inspiration! I wish I could have a canopy in my master suite, but unfortunately I cannot convince my husband that the 90s style cabinetry headboard has to go. It is pratical, but definitely not stylish. I love your blog and I love everything you post! I guess what I get the most out of, though is decorating advice. But, I really do love it all! 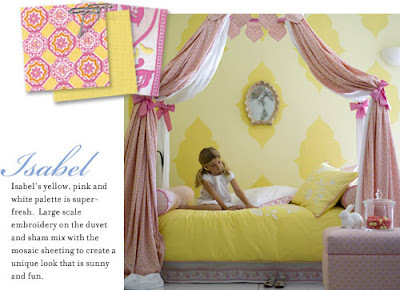 And this post has really made me a want to do a canopy in my daughter's room! I LOVE the mixture of posts you do right now. I always enjoy stopping by. Your blog is fabulous just the way it is, although I am partial to anything about home decor. I love canopy beds. I would love to have one in our master bedroom, but I'm afraid of what a temptation it would be for the cats! I love your blog! Hugs from Italy! I like your blog just the way it is...a little of this, a little of that. I like tutorials because I'm not super crafty and so those help me. And also for me anything on organization! I love reading your blog... I love that you post frequently... and I love the decorating inspiration! I would love to see you write about your process of learning photography, as well. what lens you use, shutter speeds and f stops, etc. You are truly an inspiration! I like your all your posts. I love looking into your home or other "real" homes as opposed to magazines. That being said, you find amazing images that are truly inspiring and I like how you tell us how to make it work. I love the do-it-yourself decorating ideas and tutorials. Also, big favor. Could you tell me which past HGTV dream house the twin red- checked canopy is from? I'd love to get a closer look at that bedroom. Thanks! Hi Tiffany...it was the 2004 dream home. I thought that was it when I was doing the post, but I wasn't sure, and I was being too lazy to look it up again, but I really should let everyone know...it's such a cute room! What a wonderful and inspiring blog entry. With so many different types of canopies, it's easy to find inspiration for any kind of bedroom decor. With something for everyone - from Serena and Lily's darling Isabel canopy to the clever use of a garden trellis - your wonderful collection of examples and money saving ideas make it easy to create the perfect refuge from a busy world. Thanks for doing what you do and for doing it so well! I love what you're doing already, so, I think if you just keep posting what you are inspired to post each time, I'll/we'll be THRILLED with that! Oh...I had a canopy bed when I was growing up and I loved it! I love the red check one so much~ can adults have one??? These canopies are super scrumptious! I love tutorials and I am no good at them, so please do more tutorials. That's my vote! Thanks for stopping by my blog today...that Nester sure has a way of directing traffic! I love the idea of a garden trellis!!! Candice Olson is amazing, love the idea of bed sheets to create the first one! It would look amazing and you are so right so easy to do. Fun FUn! I love coming over here for all lovely eye-candy, and reading your thoughts and suggestions. Thanks for the inspiration!! I love your Tues. posts as well as your tutorials. Actually.... I love it all!!! I like seeing a mix on a blog...a balance. Love the red one...but with my allergies I could never have one. thanks so much for this post. I've been cheaking out some beds at Ikea. I need something affordable and not too fru-fru. I want something that will work for Christian and I. I LOVE the idea to just use sheets. how about a post about lofts.... for a future date? I love it all!! Bring it on sister...:) Sleeping in a canopy bed still makes me feel like the little girl in a fairytale! There is something dreamy about a canopy bed. Thanks for the pictures. i think no matter what you post about there will always be a common thread of creativity and inspiration. just keep doing what you're doing and whatever strikes you. funny - i was just reviewing my latest posts and thought - i should take a break from these chicks already! LOL hope i achieved this with my latest. love the canopies. very cool. always wanted one of those when i was little. 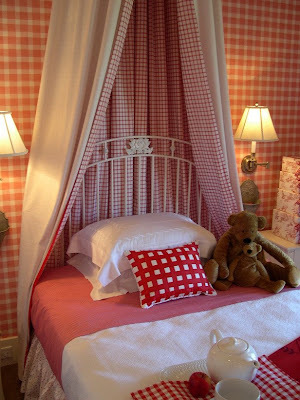 Canopy beds are so romantic and girly, I love that look, but dont think hubby would agree. I remember having a canopy bed as a little girl. I love coming to your blog, its such an inspiration. Stop by and take a look at my diy spring wreath if you get the chance.